Is rain a blessing or a curse? God sends rain on the just and on the unjust (Mat 5:45). Do you know that that statement only appears once in the bible? Is rain a blessing or a curse? Well it can be either or both. It can also be something else altogether! In our opening statement rain is a blessing plus it is something else. It is an example for us to “do good to them that hate you” (Mat 5:44, see paragraph near the end of this commentary). Let’s look at rain when it is a blessing. Rain is a blessing when it waters crops to grow food. This promise is given to the nation and land of Israel. We can learn from God’s promise to Israel. I am blessed when I have food to eat. Thank you Lord. Lev 26:4 Then I will give you rain in due season, and the land shall yield her increase, and the trees of the field shall yield their fruit. (Also Deu 11:14, Deu 28:12, Job 5:10, Zec 10:1, Heb 6:7). Israel is instructed to ask God for rain to water crops! He says that he will give rain when we ask. God blesses us with rain to cause grain seed to grow for bread, and grass to grow for cattle. So rain also provides milk and meat. Moooo! Isa 30:23 Then shall he give the rain of thy seed, that thou shalt sow the ground withal; and bread of the increase of the earth, and it shall be fat and plenteous: in that day shall thy cattle feed in large pastures. Below, the rain cycle shows God’s design and provision for his creation. God gives us rain in an amazing process and also gives it at the proper time so we can be happy! Let’s look at rain when it is a curse. Gen 7:4 For yet seven days, and I will cause it to rain upon the earth forty days and forty nights; and every living substance that I have made will I destroy from off the face of the earth. Rain is a curse when there is too much of it! God judged the whole earth with a flood. He provided Noah with a way to survive. That’s because God saves the righteous from His judgments. 1Th 5:9-10 For God hath not appointed us to wrath, but to obtain salvation by our Lord Jesus Christ, 10 Who died for us, that, whether we wake or sleep, we should live together with him. God sent Moses to judge Egypt with several plagues. This one was hail. That is hardened rain. This time the rain is too hard! First too much, now too little; this is the opposite of giving rain to water crops. Here rain is withheld so crops don’t grow and people don’t have food to eat and die. This is God’s judgment for sin. Deu 28:24 The LORD shall make the rain of thy land powder and dust: from heaven shall it come down upon thee, until thou be destroyed. Dust instead of rain? I’m against it! 1Sa 12:17-18 Is it not wheat harvest to day? I will call unto the LORD, and he shall send thunder and rain; that ye may perceive and see that your wickedness is great, which ye have done in the sight of the LORD, in asking you a king. 18 So Samuel called unto the LORD; and the LORD sent thunder and rain that day: and all the people greatly feared the LORD and Samuel. Rain is good for wheat except when it is time to harvest! A heavy downpour can ruin a crop that is ready to pick. We are all in the hands of God’s provision. He sends rains where and when He wants to. He blesses and curses where and when He wants to. I vote that we fear and honor Him! 1Ki 8:35-36 When heaven is shut up, and there is no rain, because they have sinned against thee; if they pray toward this place, and confess thy name, and turn from their sin, when thou afflictest them: 36 Then hear thou in heaven, and forgive the sin of thy servants, and of thy people Israel, that thou teach them the good way wherein they should walk, and give rain upon thy land, which thou hast given to thy people for an inheritance. (Also 2Ch 6:26-27). Above, God gives or withholds rain; especially as provision to water crops and pastures, as a gage of our faithfulness or sin. 2Ch 7:12-15 And the LORD appeared to Solomon by night, and said unto him, I have heard thy prayer, and have chosen this place to myself for an house of sacrifice. 13 If I shut up heaven that there be no rain, or if I command the locusts to devour the land, or if I send pestilence among my people; 14 If my people, which are called by my name, shall humble themselves, and pray, and seek my face, and turn from their wicked ways; then will I hear from heaven, and will forgive their sin, and will heal their land. 15 Now mine eyes shall be open, and mine ears attent unto the prayer that is made in this place. The verse above occurs when Solomon king of Israel completes building the temple. If God withholds His provision of rain, He has provided a way for us to petition Him for repentance and relief. Namely, prayer! It’s raining wrath! If we don’t honor God, He will have his way with us just when we think everything is going our way. This is God’s promise to every wicked person. The above verse refers to God’s judgment of Egypt through Moses. Again the rain is too hard! Break out the Kevlar umbrella! This was God’s warning to the nation of Israel. He kept his promise below. Jer 14:1-7 The word of the LORD that came to Jeremiah concerning the dearth. 2 Judah mourneth, and the gates thereof languish; they are black unto the ground; and the cry of Jerusalem is gone up. 3 And their nobles have sent their little ones to the waters: they came to the pits, and found no water; they returned with their vessels empty; they were ashamed and confounded, and covered their heads. 4 Because the ground is chapt, for there was no rain in the earth, the plowmen were ashamed, they covered their heads. 5 Yea, the hind also calved in the field, and forsook it, because there was no grass. 6 And the wild asses did stand in the high places, they snuffed up the wind like dragons; their eyes did fail, because there was no grass. 7 O LORD, though our iniquities testify against us, do thou it for thy name’s sake: for our backslidings are many; we have sinned against thee. If God didn’t spare his chosen people when they were wicked then he certainly won’t spare us. But if we sin we can come to God through Jesus Christ for forgiveness. The above verse refers to the battle of Gog and Magog (see my commentary titled “Magog made Easy”). Jesus himself will contend with many nations that are led by Turkey, marching against Israel. It is going to rain on them “an overflowing rain, and great hailstones, fire, and brimstone”. I hope nobody has reserved a tee time. Zec 14:17-18 And it shall be, that whoso will not come up of all the families of the earth unto Jerusalem to worship the King, the LORD of hosts, even upon them shall be no rain. 18 And if the family of Egypt go not up, and come not, that have no rain; there shall be the plague, wherewith the LORD will smite the heathen that come not up to keep the feast of tabernacles. During Jesus Christ’s one thousand year reign on earth all nations will be required to attend the feast of tabernacles in Jerusalem. God will curse any nation that does not attend with drought. Too little rain is a curse. God selectively causes or withholds rain as both a blessing and a curse. God chooses the time and place for rain to fall. God chooses whom He will bless or curse. He chooses when He will bless or curse them. He is able to distinguish between the field of the righteous, and the field of the wicked. He is also able to discern the thoughts and intents of a man’s heart. Jas 5:16-18 Confess your faults one to another, and pray one for another, that ye may be healed. The effectual fervent prayer of a righteous man availeth much. 17 Elias was a man subject to like passions as we are, and he prayed earnestly that it might not rain: and it rained not on the earth by the space of three years and six months. 18 And he prayed again, and the heaven gave rain, and the earth brought forth her fruit. Elijah was a man just like any of us, but God answered his prayer. He judged Israel by withholding rain for three and a half years. I expect my earnest prayers to be answered. I’m still waiting on some big ones. Put your goggles on as we look at rain when it might not be a blessing or a curse; it might not even be water; but something else altogether! This time “rain” is a provision and a test. Turn your umbrella upside down! It’s raining bread! Rain is a sign of God’s active direction of earth. God directs all of the processes of nature. Who is like God is?! Below; the favor of the king is like the latter rain! The latter rain brings extra blessing which leads to prosperity. Pro 16:15 In the light of the king’s countenance is life; and his favour is as a cloud of the latter rain. Rain is a discomfort. During Jesus Christ’s one thousand year reign on earth He will build a large shelter in Jerusalem for all the tribulation period martyrs. Isa 4:6 And there shall be a tabernacle for a shadow in the daytime from the heat, and for a place of refuge, and for a covert from storm and from rain. Rev 7:13-17 And one of the elders answered, saying unto me, What are these which are arrayed in white robes? and whence came they? 14 And I said unto him, Sir, thou knowest. And he said to me, These are they which came out of great tribulation, and have washed their robes, and made them white in the blood of the Lamb. 15 Therefore are they before the throne of God, and serve him day and night in his temple: and he that sitteth on the throne shall dwell among them. 16 They shall hunger no more, neither thirst any more; neither shall the sun light on them, nor any heat. 17 For the Lamb which is in the midst of the throne shall feed them, and shall lead them unto living fountains of waters: and God shall wipe away all tears from their eyes. Jer 10:13 When he uttereth his voice, there is a multitude of waters in the heavens, and he causeth the vapours to ascend from the ends of the earth; he maketh lightnings with rain, and bringeth forth the wind out of his treasures. (Also Jer 51:16 ). 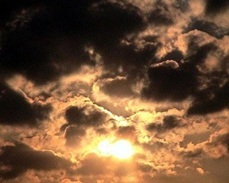 Above, the weather reflects God’s active will. He brings rain and wind out of the closet as He wishes. Jer 14:22 Are there any among the vanities of the Gentiles that can cause rain? or can the heavens give showers? art not thou he, O LORD our God? therefore we will wait upon thee: for thou hast made all these things. Certainly people don’t cause rain. The angels don’t make it rain. God alone makes it rain because He made all things. So seek God. Above, rain is a symbol of how God blesses us when we seek Him. Mat 5:43-48 Ye have heard that it hath been said, Thou shalt love thy neighbour, and hate thine enemy. 44 But I say unto you, Love your enemies, bless them that curse you, do good to them that hate you, and pray for them which despitefully use you, and persecute you; 45 That ye may be the children of your Father which is in heaven: for he maketh his sun to rise on the evil and on the good, and sendeth rain on the just and on the unjust. 46 For if ye love them which love you, what reward have ye? do not even the publicans the same? 47 And if ye salute your brethren only, what do ye more than others? do not even the publicans so? 48 Be ye therefore perfect, even as your Father which is in heaven is perfect. In the above statement rain is a blessing plus it is something else. It is an example for us to “do good to them that hate you”. Just like God makes the sun to rise and sends rain on evil people and on good people, we should love our enemies. God extends his love toward us while we are sinners. He blesses people even when they are wicked, so they can respond to his kindness. Mat 7:25-27 And the rain descended, and the floods came, and the winds blew, and beat upon that house; and it fell not: for it was founded upon a rock. 26 And every one that heareth these sayings of mine, and doeth them not, shall be likened unto a foolish man, which built his house upon the sand: 27 And the rain descended, and the floods came, and the winds blew, and beat upon that house; and it fell: and great was the fall of it. Here rain is a trial. Act 14:16-17 Who in times past suffered all nations to walk in their own ways. 17 Nevertheless he left not himself without witness, in that he did good, and gave us rain from heaven, and fruitful seasons, filling our hearts with food and gladness. Rain is a witness of God’s goodness. Rain teaches patience. The same way we wait for the latter rain and for the fruit of the earth (which are hearts opening to Christ), we are to wait for Jesus’ return! Jesus is waiting for many people to trust in him so they can be saved from hell and from the wrath of God that is about to come on Earth, before he returns for his Church!